Pharmacy Purchasing & Products: What is the current status of the proposed revisions to USP <797> Pharmaceutical Compounding—Sterile Preparations, posted on July 27, 2018, for public comment, and how will the USP chapters align with one another? Patricia C. Kienle, RPh, MPA, FASHP: To provide a unified approach to compounding, USP plans to align the timing and content of General Chapters <795> (nonsterile compounding), <797> (sterile compounding), and <800> (HD compounding). General Chapters <795> and <797> are in the active revision process. Among other content changes in the proposed revisions, the HD handling sections in <795> and <797> will reference USP <800>, which was completed and published in February 2016, and is not currently under revision. USP <795> and <797> are anticipated to be published as final documents on June 1, 2019, and along with <800>, are expected to be official and aligned on December 1, 2019. USP chapters are living documents that change to meet current needs and practice advances. The current <797> chapter was published 10 years ago; since that time, best practices and available technologies have evolved. The USP Compounding Expert Committee keeps abreast of these developments. The first revision for public comment was published in September 2015; USP received more than 8000 comments about that version. Every comment is carefully reviewed by multiple individuals to determine if it should be included, and if so, whether the wording requires editing. PP&P: What are some common themes in the comments received thus far? Kienle: The feedback the expert committee has received in both comment periods have been extremely valuable. We are currently receiving public comments from the second proposed USP <797> revision through November 30, 2018. Instructions for submitting comments are available at: www.usp.org/sites/default/files/usp/document/our-work/compounding/instructions-how-to-submit-comments-797.pdf. The most useful comments are those that identify specific statements that should be revised by their corresponding line number and suggest specific language for those revisions. A significant number of the comments received in the first round were related to allergens, hence the robust allergen section in the chapter. In addition, there were numerous requests to reduce ambiguity particularly as many state boards of pharmacy and accreditation agencies rely on the chapter to guide their inspections and surveys. Other areas of focus included the frequency of testing and the ability to apply beyond-use dating (BUD). PP&P: What are the most significant changes to the current proposed revision to USP <797>, and what is the rationale behind these proposed changes? Kienle: Seven major areas are proposed for revision, with the goals of clarifying common questions, addressing special situations, streamlining the nature of the information included in the chapter, and improving wording clarity. Drug administration will no longer be addressed via USP <797>. By excluding administration from the currently proposed revision to USP <797>, the intent is to clarify which practices are acceptable in hospitals and procedural areas. For example, when a nurse draws up part of a vial at the patient’s bedside, it is not considered compounding, but administration. When an anesthesiologist prepares a drug during a case and uses it sequentially throughout the case, this is also considered administration, not compounding. To address safe administration, the second proposed USP <797> revision directs organizations to utilize the CDC Safe Injection Practices to Prevent Transmission of Infections to Patients (available at: www.cdc.gov/injectionsafety/ip07_standardprecaution.html). CSP Microbial Risk Levels Are Simplified. This change was included in the first public comment version of <797>; the second public comment version includes further wording changes/clarifications. Microbial risk levels are redefined from the current classifications of low, medium, and high risk, and are now referred to as Category 1 and Category 2. While low, medium, and high risk levels were determined by the sterility of the starting ingredients, Category 1 and 2 risk levels are determined by the location in which the CSP is prepared. 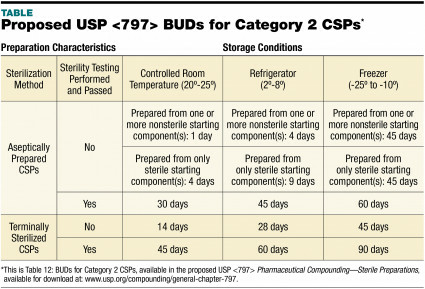 Category 1 CSPs may be prepared in an unclassified segregated compounding area (SCA) and have a BUD of 12 hours or less at room temperature (24 hours or less if refrigerated); Category 2 CSPs must be prepared in a cleanroom suite (buffer room with anteroom) and may have a longer BUD, which is determined by the sterilization method, the starting ingredients (ie, sterile vs nonsterile), storage conditions, and whether sterility testing was performed and passed (see TABLE: PROPOSED USP <797> BUDS FOR CATEGORY 2 CSPs). Guidance Is Provided on the Use and Storage of Opened or Needle-Punctured Conventionally Manufactured Products and CSPs. Organizations should follow the CDC’s Safe Injection Practices (available at: www.cdc.gov/injectionsafety/ip07_standardprecaution.html) and manufacturers’ package inserts for practical advice. The second proposed revision to USP <797> includes specific language referencing pharmacy preparation of stock solutions, which are then utilized for subsequent compounding. These bags, particularly aliquots for total parenteral nutrition (TPNs), are often used in pediatric hospitals, as commercially available electrolyte concentrations may not be suitable for babies; pharmacy typically makes a diluent of commercially available solutions for these patients, which is then used to make subsequent TPNs. The term “stock solution” was not defined by either the FDA or the original version of USP <797>, as it is not considered a finished product. To provide clarity, the second proposed revision to USP <797> contains new wording and guidance, defining single-dose containers, multiple-dose containers, and bulk packages, clarifying their respective uses and BUDs. Information on Notification and Recall of Dispensed CSPs with Out-of-Specification Results. Although, no specific changes are included in the proposed revision, the wording is clarified, as best practice for addressing out-of-specification results has evolved. Clarification of Requirements for Compounding Allergenic Extract Prescription Sets. Allergenic extract prescriptions, which are typically used in allergists’ offices to desensitize patients to various allergens, are sterile preparations that are administered intradermally; because they meet the definition of a CSP, they fall under the umbrella of USP <797>. However, these preparations are different from other CSPs in that they are heavily preserved products. In addition, short BUDs are inadequate for allergenic extracts, as each preparation is patient-specific and is usually administered over a period of months or years. In the initial comment period, multiple concerns were raised in regard to allergenic extracts. For example, because these medications are usually prepared in allergists’ offices rather than in a cleanroom, what is an appropriate BUD for allergenic extracts? Under what conditions must these medications be prepared? At what point can a BUD be applied that exceeds those in USP <797>? Clearly, specific parameters are required for these CSPs. The USP Compounding Expert Committee worked extensively with allergists to develop robust guidance, which is presented in Section 18 of the most recent USP <797> proposed revisions. It is important to note that if pharmacies prepare allergenic extracts, they should not be prepared in the regular IV room as these extracts often contain mold or pet dander; allergenic extracts must be prepared in a room separate from the regular IV room. Removal of HD References (USP <800>). Because safe handling of hazardous and nonhazardous drugs are related but separate concerns, HD handling is now discussed in its own chapter, USP <800>. No changes have been made to USP <800>. The original official date was to be July 1, 2018 but has been pushed back to December 1, 2019 in order to align its release with USP <797> and <795>. It is important to note that USP <800> is more comprehensive than either USP <797> or <795> as it incorporates both sterile and non-sterile HDs and is intended to protect everyone in the health care system who handles HDs: the individual on the loading dock, the technician preparing the drug, the nurses administering the drug, and the housekeeping/cleaning staff. The chapter also contains language specifying what constitutes an HD. Removal of Radiopharmaceuticals (USP <825>). While the current USP <797> includes a section on radiopharmaceuticals, it primarily addresses the role of the outside nuclear pharmacy and does not include comprehensive guidance for hospitals. However, the wide majority of radiopharmaceuticals are administered in hospitals or clinics. The current USP <797> does not provide specific instructions for manipulating and mixing these medications in the hospital setting. Facilities that compound radiopharmaceuticals are under regulations from the Nuclear Regulatory Commission and other state agencies; compounding radiopharmaceuticals requires lead shielding and other protective materials that are not used in other types of compounding. Therefore, the expert committee felt that the significant differences between radiopharmaceuticals and other medications justify removal of radiopharmaceuticals from USP <797> and creation of a new USP chapter to dedicate to this topic, USP <825>. USP <825> is available for public comment at: www.usp.org/chemical-medicines/general-chapter-825. PP&P: What requirements must an organization adhere to in order to extend BUDs beyond what is established in USP <797>? Kienle: I suggest that organizations adhere to the BUDs established in <797>, as extending BUDs is not an easy pursuit. If an organization decides to extend BUDs, it must comply with the specific requirements listed in the proposed revised USP <797>, which were determined using testing information, best practices, and the available literature, to identify when microbial contamination proliferates. The expert committee is considering developing a new resource to assist compounders in extending BUDs for Category 2 CSPs to include criteria for validated stability-indicating assays and testing for sterility, endotoxins, container-closure integrity, and particulate matter. The goal of this resource is to guide correct interpretation and application of testing results. No time frame has been identified for release of this potential resource. A valuable reference concerning strength and stability testing for compounded preparations is available at: www.usp.org/sites/default/files/usp/document/FAQs/strength-stability-testing-compounded-preparations.pdf. PP&P: What education and training will be required for staff based on the changes that are proposed to USP <797>? All personnel must demonstrate competency through written and hands-on testing. In addition, media fill and fingertip testing now must be performed every 6 months. PP&P: Looking to the future, are there any additional goals that USP has for the chapter? Kienle: The purpose of USP <797> is to ensure safe sterile compounding. As technology evolves, so should practice evolve to ensure CSPs are produced safely and patients receive safe, efficacious medications. Patricia C. Kienle, RPh, MPA, FASHP, Director of Accreditation and Medication Safety for Cardinal Health, is a member of the USP Compounding Expert Committee and chair of the Hazardous Drug Subcommittee and Expert Panel, although her comments herein are her own and not official information from USP.